Ryusen Saya (sheath) for Paring Knife - Petty Knife - 4 in. Product Description for Ryusen Saya (sheath) for Paring Knife - Petty Knife - 4 in. 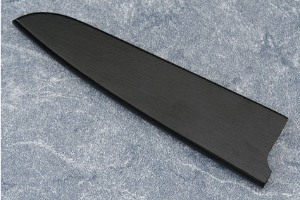 Description: Saya (traditional Japanese wooden sheaths) protect a knife's edge when stored in a drawer or knife roll. It is designed specifically to fit our Ryusen Damascus Paring Knife - Petty Knife - 4 in. If ordered with the knife, we will verify a perfect fit. If ordered separately, the saya may need to be modified to perfectly fit the knife as both the knife and saya are handmade. This saya (sheath) is handmade from ho wood (a close relative of magnolia) and coated with traditional Japanese black lacquer for resistance to moisture. 0.125 0.06201171875 125 62.01171875 Trailer Started.